Amor Towles recreates the glitz and glamour of New York City in the late 1930s in Rules of Civility. Think art deco, jazz clubs, martinis and plush hotels. As I read this book I couldn’t help but be reminded of F. Scottt Fitzgerald’s The Great Gatsby. While Rules of Civility is set 15 years later than Fitzgerald’s classic and on the other side of the Great Depression, both books explore the lifestyles and inner workings of New York’s wealthy upper class. Rules of Civility tells the story of Katy Kontent who works in a secretarial pool and lives in a Manhattan boarding house with her best friend, Eve Ross. Katy and Eve earn barely enough money to cover their rent until a chance encounter with wealthy banker Tinker Grey sets their lives on a new course. At a time when women were expected to aspire to be good housewives, Towles creates some gutsy female characters who cast stereotypes aside. 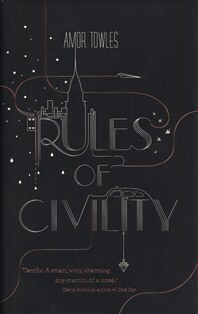 Rules of Civility is also a story of New York, where fortunes are made and lost and where tales of rags to riches sit alongside tales of riches to rags. This is definitely one of my favorite books I have read in the last few years. Amor Towles takes you on a visual mind fest from the very start. I got so lost at times I felt I had lived in NYC during the 1920's & 30's instead of now. Some days, as I got off the subway to head to work, I was so wrapped up in what was happening, I would have to sit on a subway bench and finish that page, paragraph, or chapter. I can only hope it is made into a movie and Hollywood does not screw it up.